We caught the train from Clapham Junction to Gatwick Airport which took a little under 25 minutes, then from London Gatwick Airport, we flew straight to Belfast International. The flight was pretty quick and took us an hour and a half to get there. Because we arrived quite late in the evening, we decided to grab a taxi from the taxi rank directly outside the main doors of the airport. We used the Belfast Internationational Airport Taxis firm to get to our hotel and it took us around 30 minutes to get there. 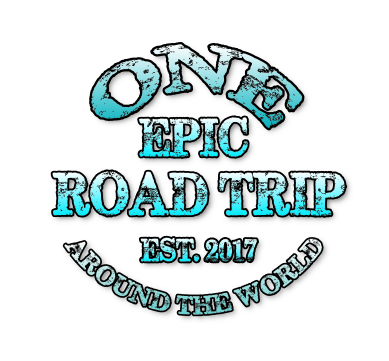 I have to give a big shout out to our taxi driver Noel, who gave us great customer service and was full of recommendations on where to visit and the best times to visit as well as booking our return taxi to the airport and organising our taxi tour with his colleague. Note: There is an option to catch a bus from the airport, we found that a number 300 bus would have taken us near our hotel in just under an hour. 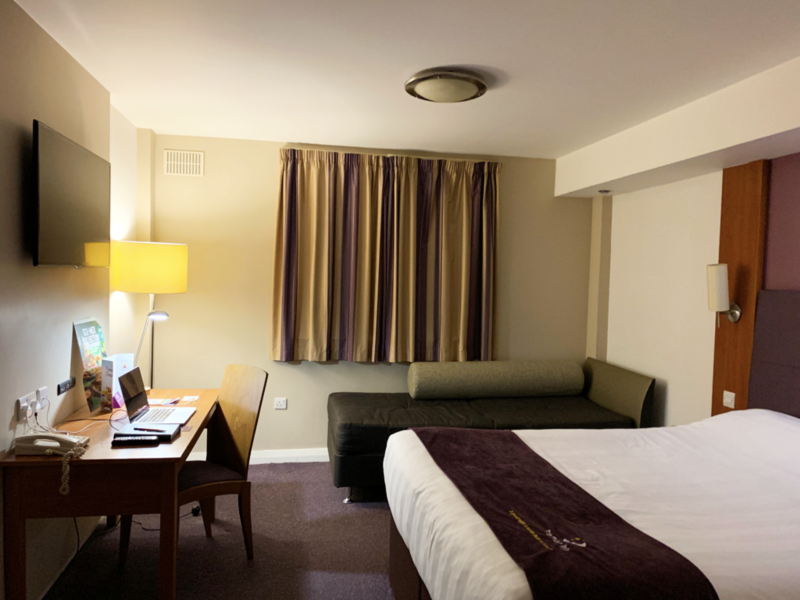 We stayed at the Premier Inn, Alfred Street which was pretty central to everything, with a 5-minute walk to the bars and restaurants and 10-15 minute walk into the city centre. This was my first time staying at a Premier Inn and I have to say that I would recommend the Premier Inn, Alfred Street. We booked two rooms and personally for me the room was spacious and clean with everything that I could need for a relaxing stay which included; a comfortable double bed that I just melted in, a desk, tv, a bath and shower with fresh towels put in on both days we stayed and a kettle the only thing missing from the room was a mini-fridge to put cold drinks in. The hotel also had a bar that was open till late and a restaurant as well as 24-hour reception desk, fast free wifi and the staff where all very friendly and approachable. The breakfast wasn’t included in our booking so we paid the extra for each of the two days we were there and the breakfast buffet was always well stocked. If the Premier Inn doesn’t take your fancy their are plenty of hotels and air b&b’s that you can choose from. I’m not going to go into much detail on this post as I am going to write a more detailed blog post on this and add some video content as well. I’m still taking in what I learnt about the Troubles from our driver and tour guide Paul. 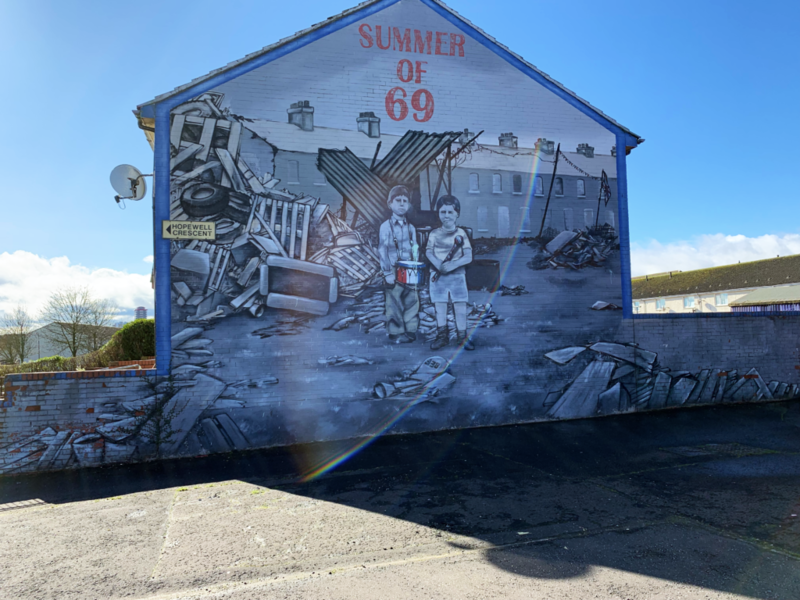 I grew up hearing about the troubles in Ireland on the news and even when the troubles came to London, I never really understood why it was happening, because as a child it wasn’t something that was talked about in school and information to learn about this wasn’t so readily available as it is now online. So, for me to be able to hear about the Troubles from someone who witnessed it first hand and even knew some of the people involved really was an eye opener and gave me more of an understanding as to what caused the Troubles and sadly so many deaths. Our driver Paul took us to both the Catholic and the Protestant sides we learnt the stories behind the political murals, we visited the memorial gardens and got up close and personal with the peace walls that separate the Catholics and the Protestants and we also visited a Catholic cemetery and learnt about the priests who helped to broker a ceasefire. I am glad that we booked this tour because it was a very eye-opening and educational tour. I highly recommend booking with Paul at Belfast International Taxis. Paul was very knowledgeable and unbiased when it came to explaining both sides of the Troubles. 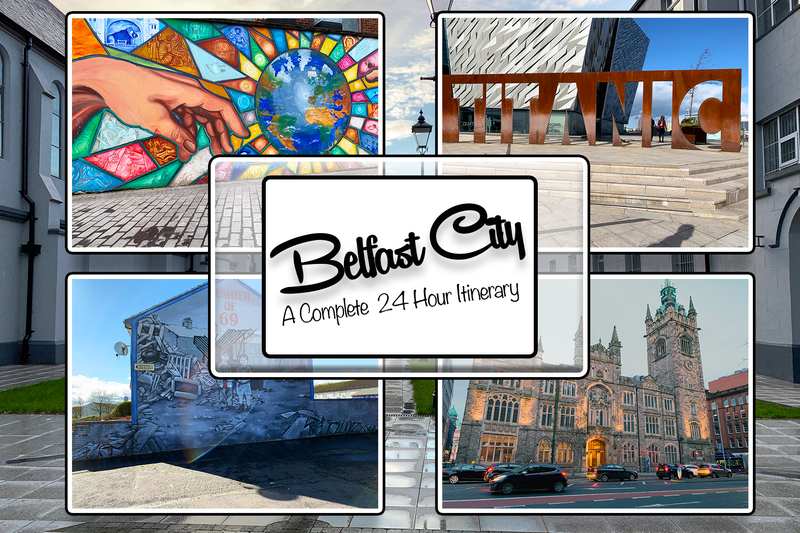 Whichever company you decide to book a tour with, you’ll need to book between 24-48 hours in advance, we went with Belfast International Taxis and did a 2-hour tour. 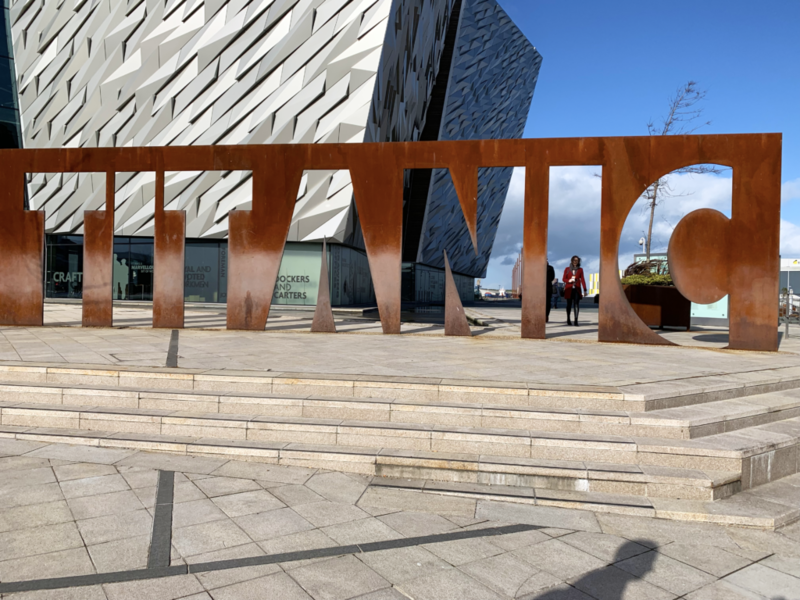 Once we finished our Taxi tour we had Paul our driver drop us off in the Titanic Quatre, so we could make our way to The Titanic Belfast Experience. Everybody knows the final act of the Titanic’s story which went from Southhampton and was heading to New York, but sadly never reached its intended destination as it was hit by a giant iceberg. But like every story, the Titanic’s story starts in Belfast at the Harland and Wolff shipyard, the worlds most famous ship to have ever sunk starts here where a workforce 15,000 locals put blood, sweat and tears into building the Titanic. This is the worlds biggest Titanic attractions, it’s exhibit is both interactive and visual covering every step from its creation to its maiden voyage and has even won awards, this attraction is not to be missed. 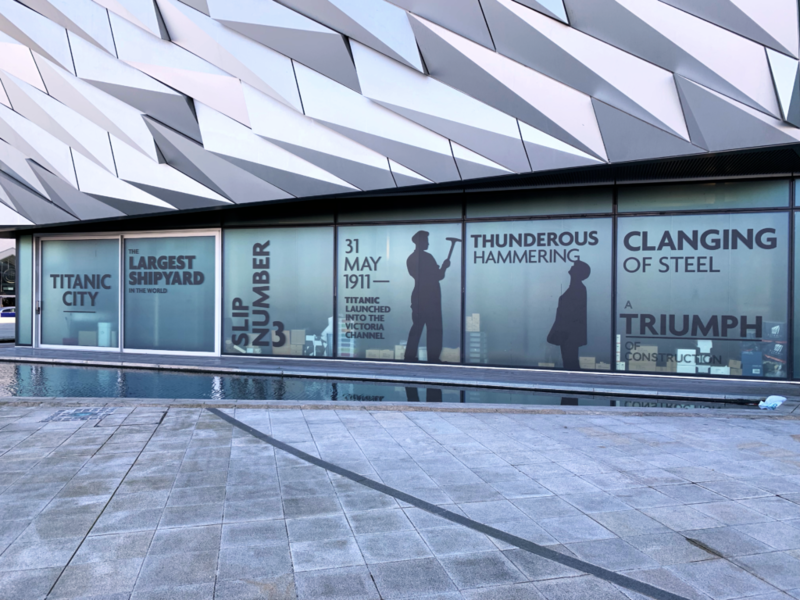 This exhibit is both inside and outside so be prepared to spend at least two hours exploring you can book your tickets by going two the Titanic Belfast website directly and I will also be writing a more detailed post about the experience soon. Fun Fact: The Titanic Exhibit is near the studio where some of the show Game of Thrones was filmed. 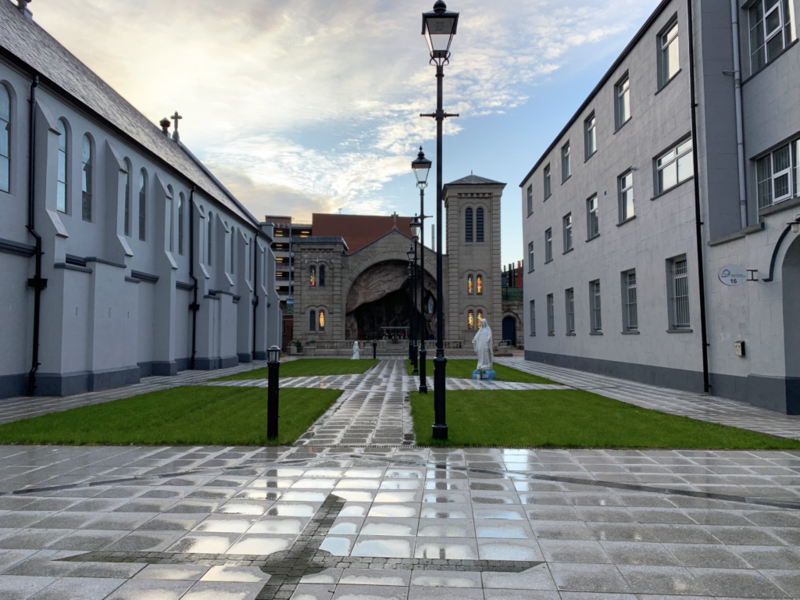 Just a 10 to 12-minute walk from the Titanic Quatre is the Town Centre and unless you deliberately go out of your way to avoid it at some point you will stumble into the main area. 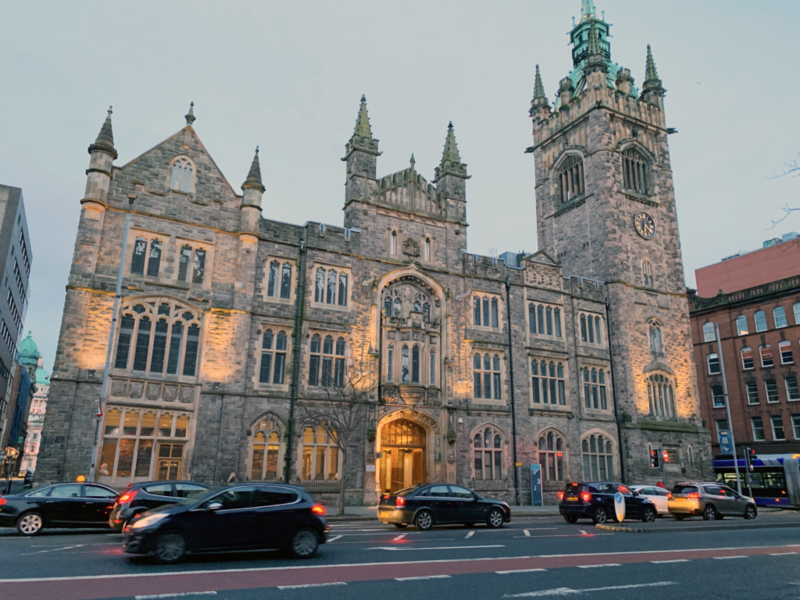 Belfast town centre has everything from the Victoria shopping centre that is hard to miss with a beautiful glass dome that makes it stand out, it also has well known branded shops, a cinema, bars and restaurants, followed by more shops, bars and restaurants on the street. But another thing that really stands out in Belfast after the murals is the architecture. In the photo above you will see the Albert Memorial Clock which is Belfast’s answer to the Leaning Tower of Pisa, which was erected between 1865-1869 this Gothic-styled tower is tilted because it stands on reclaimed land and in 2002 was part of a restoration project funded by the national lottery. There are also beautiful Churches and Cathedrals to visit as well as various monuments dotted around the area. 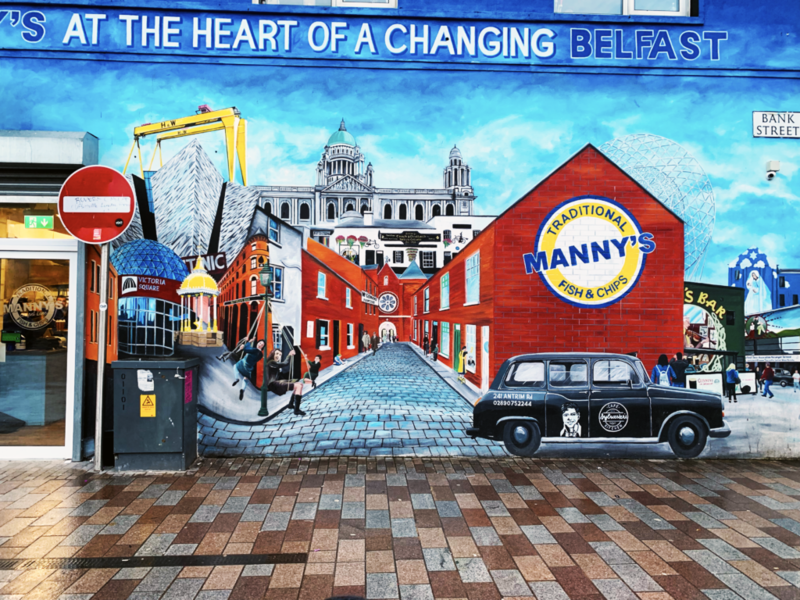 Unlike the murals seen during our taxi tour, the Belfast city centre murals are designed to show a new side to Belfast which is a more welcoming and peaceful side. The inspiration behind the murals is environmental, humorous and peaceful. These have been created to make some of the run-down areas look a lot more beautiful and photogenic. 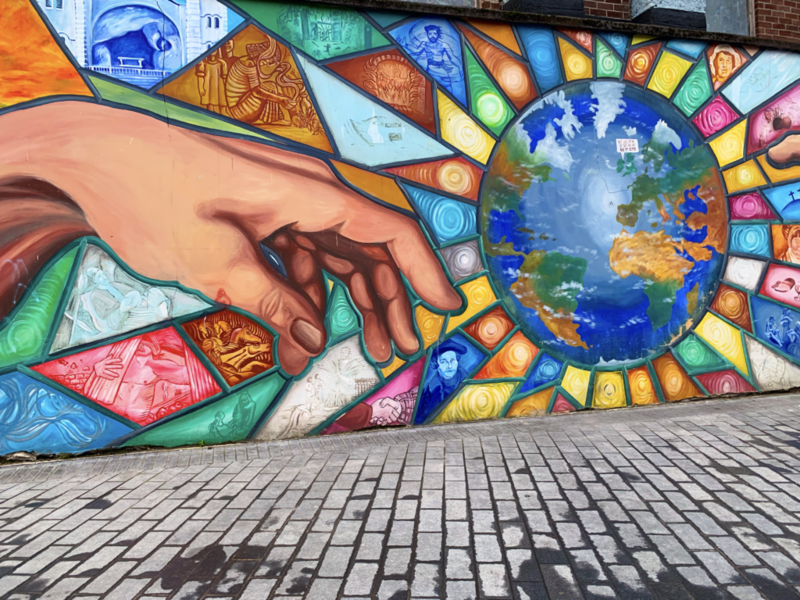 I am sure you will agree that Belfast is probably the most artistic city in Europe when it comes to street art, with every wall telling its own unique story both good and bad. No visit to Belfast would be complete without stepping into a pub and listening to some live music. 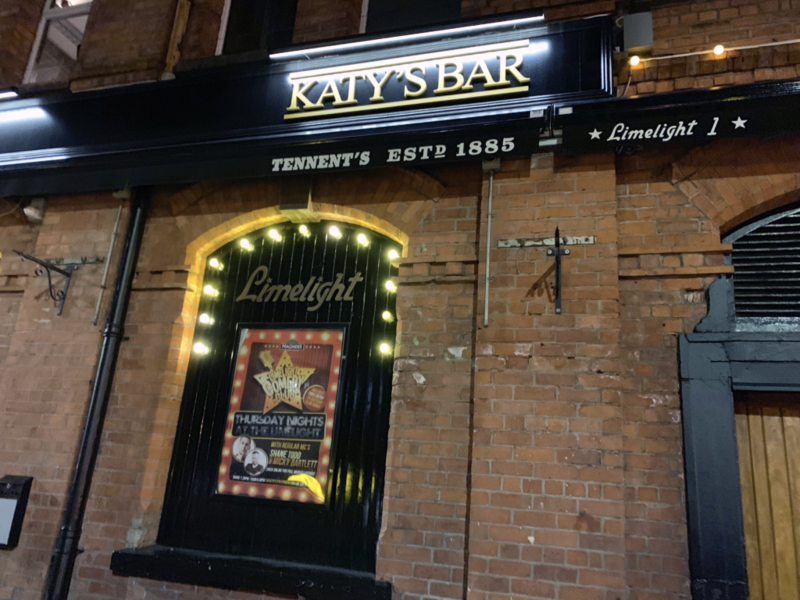 Belfast has quite a lively nightlife with a venue to suit everyone from traditional pubs and sports bars as well as bars and nightclubs with live music and DJ’s. We visited a few different bars and were lucky enough to have a great atmosphere in all the venues we visited, but to find out the best bars to visit is to ask a local or your hotel reception. 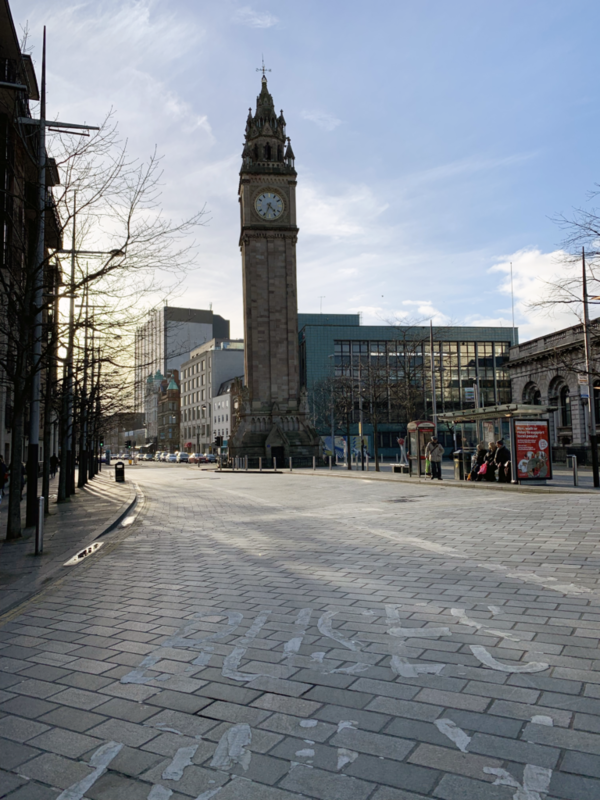 Belfast Town centre is pretty easy to get around via foot, apart from the taxi tour and the airport run we walked everywhere and used our phones if we needed directions. But if you don’t want to walk there is an option to catch a bus or a taxi. The Currency is sterling (the pound) so if you are from the UK you won’t be charged for using your bank card over there. The Time Zone is Greenwich mean time. 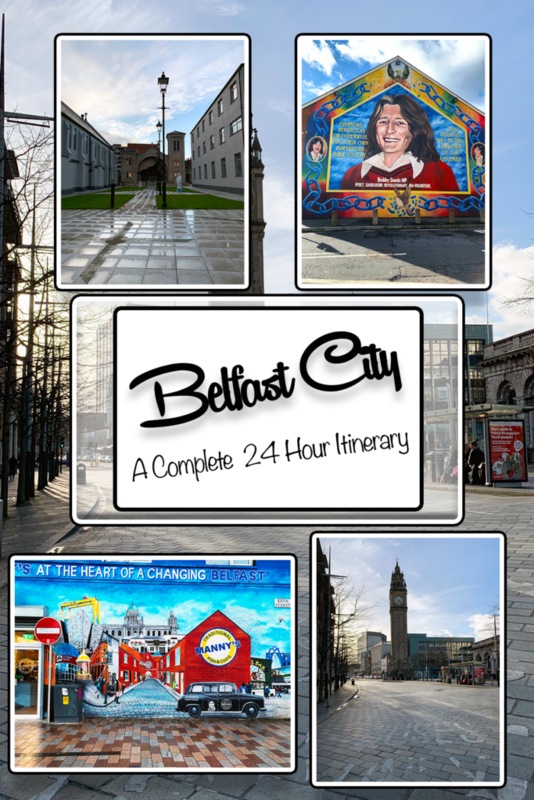 I hope that you have enjoyed this post and if your going to Belfast let me know how you got on also if you have been to or are from Belfast what would recommend doing? (comment below). This all looks like an incredible experience, particularly the mural tour. I’m so looking forward to your future post about a more in depth understanding of what you learned about The Troubles, I loved learning about history and it’s cool that you got to speak with people who actually lived through such events, it always provides a great insight. The Titanic experience looks incredible, I hope I’m able to go some day. Glad I re-read this, at first I thought you said “two hours waiting” for the museum, but I see it’s two hours exploring! That’s a manageable amount of time and it seems like the museum as a whole is captivating. Thanks for sharing, great read! I visitied Belfast a few years ago but I was only there for the day. I LOVED the Titanic Museum it was so interesting and there was so much to do. 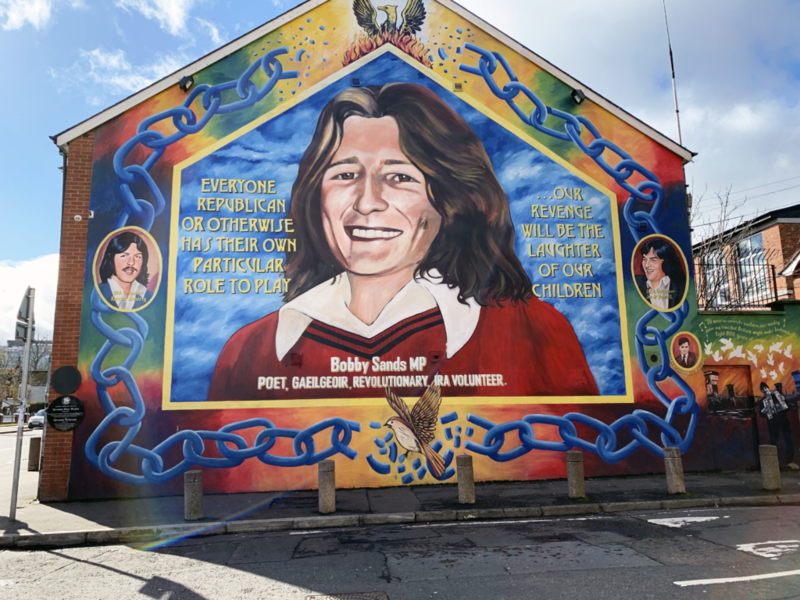 I am going again later this year so I will need to try out the Tour of the Murals. When I was in Belfast I was there on a Sunday and in the city centre there is a big craft market. It was jam packed of the most amazing handmade products.